Mega Sale! Save 21% on the Kensington Guardian 6 Outlet, 15-Foot Cord, 540 Joules Premium Surge Protector (K38215NA) by Kensington at Pacs BG. MPN: K38215NA. Hurry! Limited time offer. Offer valid only while supplies last. The Guardian Premium Surge-Protector Power Strip provide surge protection for computers and electronic equipment located up to 6 feet from an outlet. 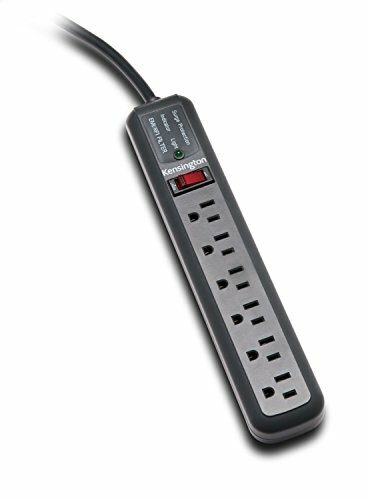 The Guardian Premium Surge-Protector Power Strip provide surge protection for computers and electronic equipment located up to 6 feet from an outlet. Expands available outlets, while protecting valuable investments against damaging power surges and spikes. Six-outlet strip features 540 joules of protection and 330V clamping. Gray. Lifetime product warranty; UL listed and CSA certified.